I’ve always admired gardeners for a hobby that produces food that’s not only delicious, but also eco-friendly and sustainable. I mean, what’s more local than your own backyard? The University of Washington and the City of Seattle did a study on greenhouse gas emissions from locally sourced food versus food sourced out of state or internationally. 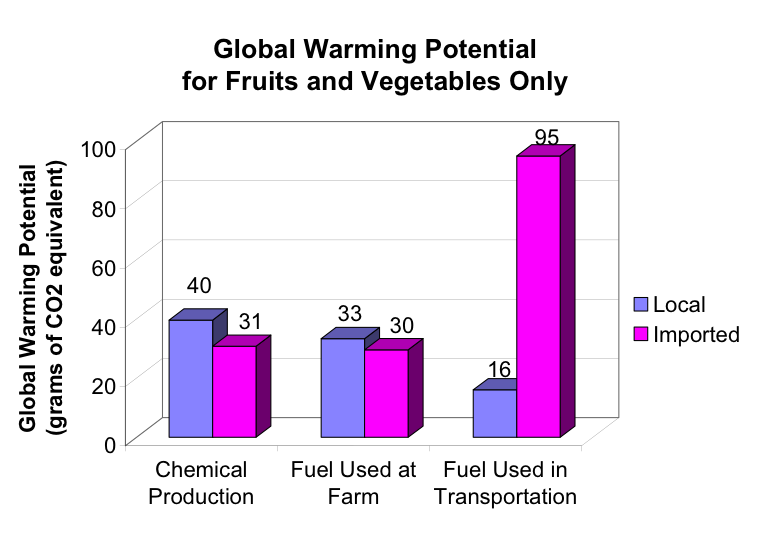 (Find it here) They found that the fuel used to transportation non-local fruits and vegetables produced almost six times as much CO2 as local alternatives. That’s a lot of CO2 we can cut out of our daily lives by simply eating locally sourced and homegrown food. Growing up, I hated gardening. However now that I’ve matured a bit, as my mother would say, I’ve found a type of gardening that’s right up my alley. Container gardening. Container gardening is great because even those with apartments, can do it. And these days there are so many recycled, or compostable options for containers, that’s there’s really no excuse to not give it a try. The best way to start is to pick something to plant that you’ll actually eat. There’s no point growing something that you won’t eat or store for later. For me, I chose zucchini and strawberries. I eat them raw, as well as making them into zucchini bread and strawberry jam. It’s fantastic to eat the fruits of my labors year round. It’s also important to pick something that does well in your climate and that you’ll actually be able to devote the time to upkeep. Also make sure you know when to plant, and what to expect from your plants. Try the Farmer’s Almanac for a list of last expected frost dates as a start. So do your research and if all else fails, hit your local garden store, there’s always someone there waiting to convert another person to gardening. The next step is to find a container to put your plants into. I’ve listed a few companies below and their websites, who have eco-friendly container options. Woolly pockets work great for apartments and small spaces, and can go just about anywhere. If you don’t want to buy something, it really can be as easy as cutting off the top of the topsoil bag, poking holes in the bottom to drain, and planting the seeds directly into the bag. I’ve also been known to reuse my plastic storage boxes from the house to store my plants in. Make sure when choosing a container, that you remember that your plant will grow roots down into the soil, and your container will need to be deep enough to accommodate them. Now just do your research, buy some seeds, and begin planting! I love container gardening, and the BIG plus that stands out to me is the convenience. At our home, the old garden is far away from the house, meaning that trips to the garden have to be planned. When we started container gardening, it was so easy to put containers right outside our home, so every time we walked from the house to the car, we noticed them. Admittedly, that was enough to give us incentive to keep up with the garden much better, because everyone who came by saw first-hand how we were doing! Not only that, but it was so nice to just walk right outside and pick something we wanted for dinner. I am definitely sold on container gardening, and plan to do it for years to come.